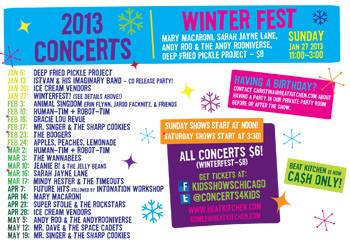 Hey Chicago Families--ChiIL out this winter with ChiIL Mama, press sponsor for Beat Kitchen's Concerts for Kids from 2011-2013. We have rockin' fam friendly shows EVERY Sunday at noon and we're expanding to include some Saturdays too!! ChiIL Mama has 4 free tickets weekly, for one of our lucky readers. Enter any or all. Spread the word and enter like we vote in Chi, IL...early and often! Out of the area? You can still enter to win our CD giveaways (and more)--open to anyone in the USA 18+. We also have tons of original footage from live kids' shows at Beat Kitchen, video band interviews and more. So you can live vicariously, and rock out at home, just by checking out our free site here at ChiILMama.com. Enter below for ChiIL Mama's February Beat Kitchen Concerts for Kids Giveaways (4 tickets to each). Shows are noon unless noted otherwise.